For the ecological classification, see Macrophage (ecology). A macrophage of a mouse stretching its "arms" (pseudopodia) to engulf two particles, possibly pathogens. Trypan Blue Exclusion. Macrophages (Greek: big eaters, from Greek μακρος (makros) = large, φαγειν (phagein) = to eat) are a type of white blood cell that engulfs and digests cellular debris, foreign substances, microbes, cancer cells, and anything else that does not have the types of proteins specific of healthy body cells on its surface in a process called phagocytosis. These large phagocytes are found in essentially all tissues, where they patrol for potential pathogens by amoeboid movement. They take various forms (with various names) throughout the body (e.g., histiocytes, Kupffer cells, alveolar macrophages, microglia, and others), but all are part of the mononuclear phagocyte system. Besides phagocytosis, they play a critical role in nonspecific defense (innate immunity) and also help initiate specific defense mechanisms (adaptive immunity) by recruiting other immune cells such as lymphocytes. For example, they are important as antigen presenters to T cells. In humans, dysfunctional macrophages cause severe diseases such as chronic granulomatous disease that result in frequent infections. Beyond increasing inflammation and stimulating the immune system, macrophages also play an important anti-inflammatory role and can decrease immune reactions through the release of cytokines. Macrophages that encourage inflammation are called M1 macrophages, whereas those that decrease inflammation and encourage tissue repair are called M2 macrophages. This difference is reflected in their metabolism; M1 macrophages have the unique ability to metabolize arginine to the "killer" molecule nitric oxide, whereas rodent M2 macrophages have the unique ability to metabolize arginine to the "repair" molecule ornithine. Human macrophages are about 21 micrometres (0.00083 in) in diameter and are produced by the differentiation of monocytes in tissues. They can be identified using flow cytometry or immunohistochemical staining by their specific expression of proteins such as CD14, CD40, CD11b, CD64, F4/80 (mice)/EMR1 (human), lysozyme M, MAC-1/MAC-3 and CD68. Macrophages were first discovered by Élie Metchnikoff, a Russian zoologist, in 1884. When a monocyte enters damaged tissue through the endothelium of a blood vessel, a process known as the leukocyte extravasation, it undergoes a series of changes to become a macrophage. Monocytes are attracted to a damaged site by chemical substances through chemotaxis, triggered by a range of stimuli including damaged cells, pathogens and cytokines released by macrophages already at the site. At some sites such as the testis, macrophages have been shown to populate the organ through proliferation. Unlike short-lived neutrophils, macrophages survive longer in the body up to a maximum of several months. Macrophages are professional phagocytes and are highly specialized in removal of dying or dead cells and cellular debris. This role is important in chronic inflammation, as the early stages of inflammation are dominated by neutrophils, which are ingested by macrophages if they come of age (see CD31 for a description of this process). The neutrophils are at first attracted to a site, where they proliferate, before they are phagocytized by the macrophages. When at the site, the first wave of neutrophils, after the process of aging and after the first 48 hours, stimulate the appearance of the macrophages whereby these macrophages will then ingest the aged neutrophils. The removal of dying cells is, to a greater extent, handled by fixed macrophages, which will stay at strategic locations such as the lungs, liver, neural tissue, bone, spleen and connective tissue, ingesting foreign materials such as pathogens and recruiting additional macrophages if needed. When a macrophage ingests a pathogen, the pathogen becomes trapped in a phagosome, which then fuses with a lysosome. Within the phagolysosome, enzymes and toxic peroxides digest the pathogen. However, some bacteria, such as Mycobacterium tuberculosis, have become resistant to these methods of digestion. Typhoidal Salmonellae too induce their own phagocytosis by host macrophages in vivo, and inhibit digestion by lysosomal action, thereby use macrophages to replicate and cause macrophage apoptosis. Macrophages can digest more than 100 bacteria before they finally die due to their own digestive compounds. Macrophages are versatile cells that play many roles. As scavengers, they rid the body of worn-out cells and other debris. Along with dendritic cells, they are foremost among the cells that present antigens, a crucial role in initiating an immune response. As secretory cells, monocytes and macrophages are vital to the regulation of immune responses and the development of inflammation; they produce a wide array of powerful chemical substances (monokines) including enzymes, complement proteins, and regulatory factors such as interleukin-1. At the same time, they carry receptors for lymphokines that allow them to be "activated" into single-minded pursuit of microbes and tumour cells. After digesting a pathogen, a macrophage will present the antigen (a molecule, most often a protein found on the surface of the pathogen and used by the immune system for identification) of the pathogen to the corresponding helper T cell. The presentation is done by integrating it into the cell membrane and displaying it attached to an MHC class II molecule, indicating to other white blood cells that the macrophage is not a pathogen, despite having antigens on its surface. Eventually, the antigen presentation results in the production of antibodies that attach to the antigens of pathogens, making them easier for macrophages to adhere to with their cell membrane and phagocytose. In some cases, pathogens are very resistant to adhesion by the macrophages. The antigen presentation on the surface of infected macrophages (in the context of MHC class II) in a lymph node stimulates TH1 (type 1 helper T cells) to proliferate (mainly due to IL-12 secretion from the macrophage). When a B-cell in the lymph node recognizes the same unprocessed surface antigen on the bacterium with its surface bound antibody, the antigen is endocytosed and processed. The processed antigen is then presented in MHCII on the surface of the B-cell. T cells that express the T cell receptor which recognizes the antigen-MHCII complex (with co-stimulatory factors- CD40 and CD40L) cause the B-cell to produce antibodies that help opsonisation of the antigen so that the bacteria can be better cleared by phagocytes. Macrophages provide yet another line of defense against tumor cells and somatic cells infected with fungus or parasites. Once a T cell has recognized its particular antigen on the surface of an aberrant cell, the T cell becomes an activated effector cell, producing chemical mediators known as lymphokines that stimulate macrophages into a more aggressive form. 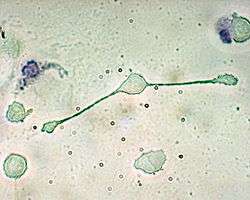 Some believe that there are several activated forms of macrophages. In spite of a spectrum of ways to activate macrophages, there are two main groups designated M1 and M2. M1 macrophages, as mentioned earlier (previously referred to as classically activated macrophages), M1 "killer" macrophages are activated by LPS and IFN-gamma, and secrete high levels of IL-12 and low levels of IL-10. In contrast, the M2 "repair" designation (also referred to as alternatively activated macrophages) broadly refers to macrophages that function in constructive processes like wound healing and tissue repair, and those that turn off damaging immune system activation by producing anti-inflammatory cytokines like IL-10. M2 is the phenotype of resident tissue macrophages, and can be further elevated by IL-4. M2 macrophages produce high levels of IL-10, TGF-beta and low levels of IL-12. Tumor-associated macrophages are mainly of the M2 phenotype, and seem to actively promote tumor growth. Both M1 and M2 macrophages play a role in promotion of atherosclerosis. M1 macrophages promote atherosclerosis by inflammation. M2 macrophages can remove cholesterol from blood vessels, but when the cholesterol is oxidized, the M2 macrophages become apoptotic foam cells contributing to the atheromatous plaque of atherosclerosis. The first step to understanding the importance of macrophages in muscle repair, growth, and regeneration is that there are two "waves" of macrophages with the onset of damageable muscle use – subpopulations that do and do not directly have an influence on repairing muscle. The initial wave is a phagocytic population that comes along during periods of increased muscle use that are sufficient to cause muscle membrane lysis and membrane inflammation, which can enter and degrade the contents of injured muscle fibers. These early-invading, phagocytic macrophages reach their highest concentration about 24 hours following the onset of some form of muscle cell injury or reloading. Their concentration rapidly declines after 48 hours. The second group is the non-phagocytic types that are distributed near regenerative fibers. These peak between two and four days and remain elevated for several days during the hopeful muscle rebuilding. The first subpopulation has no direct benefit to repairing muscle, while the second non-phagocytic group does. It is thought that macrophages release soluble substances that influence the proliferation, differentiation, growth, repair, and regeneration of muscle, but at this time the factor that is produced to mediate these effects is unknown. It is known that macrophages' involvement in promoting tissue repair is not muscle specific; they accumulate in numerous tissues during the healing process phase following injury. Macrophages are essential for wound healing. They replace polymorphonuclear neutrophils as the predominant cells in the wound by day two after injury. Attracted to the wound site by growth factors released by platelets and other cells, monocytes from the bloodstream enter the area through blood vessel walls. Numbers of monocytes in the wound peak one to one and a half days after the injury occurs. Once they are in the wound site, monocytes mature into macrophages. The spleen contains half the body's monocytes in reserve ready to be deployed to injured tissue. The macrophage's main role is to phagocytize bacteria and damaged tissue, and they also debride damaged tissue by releasing proteases. Macrophages also secrete a number of factors such as growth factors and other cytokines, especially during the third and fourth post-wound days. These factors attract cells involved in the proliferation stage of healing to the area. Macrophages may also restrain the contraction phase. Macrophages are stimulated by the low oxygen content of their surroundings to produce factors that induce and speed angiogenesis  and they also stimulate cells that reepithelialize the wound, create granulation tissue, and lay down a new extracellular matrix. By secreting these factors, macrophages contribute to pushing the wound healing process into the next phase. Scientists have elucidated that as well as eating up material debris, macrophages are involved in the typical limb regeneration in the salamander. They found that removing the macrophages from a salamander resulted in failure of limb regeneration and a scarring response. As described above, macrophages play a key role in removing dying or dead cells and cellular debris. Erythrocytes have a lifespan on average of 120 days and so are constantly being destroyed by macrophages in the spleen and liver. Macrophages will also engulf macromolecules, and so play a key role in the pharmacokinetics of parenteral irons. The iron that is released from the haemoglobin is either stored internally in ferritin or is released into the circulation via ferroportin. In cases where systemic iron levels are raised, or where inflammation is present, raised levels of hepcidin act on macrophage ferroportin channels, leading to iron remaining within the macrophages. Investigations concerning Kupffer cells are hampered because in humans, Kupffer cells are only accessible for immunohistochemical analysis from biopsies or autopsies. From rats and mice, they are difficult to isolate, and after purification, only approximately 5 million cells can be obtained from one mouse. Macrophages can express paracrine functions within organs that are specific to the function of that organ. In the testis for example, macrophages have been shown to be able to interact with Leydig cells by secreting 25-hydroxycholesterol, an oxysterol that can be converted to testosterone by neighbouring Leydig cells. Also, testicular macrophages may participate in creating an immune privileged environment in the testis, and in mediating infertility during inflammation of the testis. Macrophages can be classified on basis of the fundamental function and activation. According to this grouping there are classically activated macrophages, wound-healing macrophages (alternatively activated macrophages) and regulatory macrophages (Mregs). Due to their role in phagocytosis, macrophages are involved in many diseases of the immune system. For example, they participate in the formation of granulomas, inflammatory lesions that may be caused by a large number of diseases. Some disorders, mostly rare, of ineffective phagocytosis and macrophage function have been described, for example. In their role as a phagocytic immune cell macrophages are responsible for engulfing pathogens to destroy them. Some pathogens subvert this process and instead live inside the macrophage. This provides an environment in which the pathogen is hidden from the immune system and allows it to replicate. Diseases with this type of behaviour include tuberculosis (caused by Mycobacterium tuberculosis) and leishmaniasis (caused by Leishmania species). Once engulfed by a macrophage, the causative agent of tuberculosis, Mycobacterium tuberculosis, avoids cellular defenses and uses the cell to replicate. 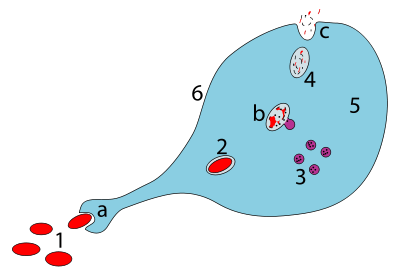 Upon phagocytosis by a macrophage, the Leishmania parasite finds itself in a phagocytic vacuole. Under normal circumstances, this phagocytic vacuole would develop into a lysosome and its contents would be digested. Leishmania alter this process and avoid being destroyed; instead, they make a home inside the vacuole. Infection of macrophages in joints is associated with local inflammation during and after the acute phase of Chikungunya (caused by CHIKV or Chikungunya virus). Adenovirus (most common cause of pink eye) can remain latent in a host macrophage, with continued viral shedding 6–18 months after initial infection. Brucella spp. can remain latent in a macrophage via inhibition of phagosome–lysosome fusion; causes brucellosis (undulant fever). Macrophages are the predominant cells involved in creating the progressive plaque lesions of atherosclerosis. Focal recruitment of macrophages occurs after the onset of acute myocardial infarction. These macrophages function to remove debris, apoptotic cells and to prepare for tissue regeneration. Macrophages also play a role in human Immunodeficiency Virus (HIV) infection. Like T cells, macrophages can be infected with HIV, and even become a reservoir of ongoing virus replication throughout the body. HIV can enter the macrophage through binding of gp120 to CD4 and second membrane receptor, CCR5 (a chemokine receptor). Both circulating monocytes and macrophages serve as a reservoir for the virus. Macrophages are better able to resist infection by HIV-1 than CD4+ T cells, although susceptibility to HIV infection differs among macrophage subtypes. Macrophages contribute to tumor growth and progression. Attracted to oxygen-starved (hypoxic) and necrotic tumor cells they promote chronic inflammation. Inflammatory compounds such as tumor necrosis factor (TNF)-alpha released by the macrophages activate the gene switch nuclear factor-kappa B. NF-κB then enters the nucleus of a tumor cell and turns on production of proteins that stop apoptosis and promote cell proliferation and inflammation. Moreover, macrophages serve as a source for many pro-angiogenic factors including vascular endothelial factor (VEGF), tumor necrosis factor-alpha (TNF-alpha), granulocyte macrophage colony-stimulating factor (GM-CSF) and IL-1 and IL-6  contributing further to the tumor growth. Macrophages have been shown to infiltrate a number of tumors. Their number correlates with poor prognosis in certain cancers including cancers of breast, cervix, bladder and brain. Tumor-associated macrophages (TAMs) are thought to acquire an M2 phenotype, contributing to tumor growth and progression. Recent study findings suggest that by forcing IFN-α expression in tumor-infiltrating macrophages, it is possible to blunt their innate protumoral activity and reprogram the tumor microenvironment toward more effective dendritic cell activation and immune effector cell cytotoxicity. Increased number of pro-inflammatory macrophages within obese adipose tissue contributes to obesity complications including insulin resistance and diabetes type 2. Within the fat (adipose) tissue of CCR2 deficient mice, there is an increased number of eosinophils, greater alternative Macrophage activation, and a propensity towards type 2 cytokine expression. Furthermore this effect was exaggerated when the mice became obese from a high fat diet. conidia in a cooperative manner. The J774 cells were treated with 5 ng/ml interferon-γ one night before filming with conidia. Observations were made every 30s over a 2.5hr period. Two highly active alveolar macrophages can be seen ingesting conidia. Time lapse is 30s per frame over 2.5hr. ↑ Macrophage is sometimes abbreviated Mφ or MΦ. ↑ "Regenerative Medicine Partnership in Education". ↑ Ovchinnikov, Dmitry A. (2008). "Macrophages in the embryo and beyond: Much more than just giant phagocytes". Genesis. Institute for Molecular Bioscience and Cooperative Research Centre for Chronic Inflammatory Diseases (CRC-CID), University of Queensland, Brisbane, Queensland, Australia. : researchgate.net. 46 (9): 447–62. doi:10.1002/dvg.20417. PMID 18781633. Retrieved 2013-06-28. Macrophages are present essentially in all tissues, beginning with embryonic development and, in addition to their role in host defense and in the clearance of apoptotic cells, are being increasingly recognized for their trophic function and role in regeneration. ↑ Mills, C. D. (2012). "M1 and M2 Macrophages: Oracles of Health and Disease". Critical reviews in immunology. 32 (6): 463–488. doi:10.1615/CritRevImmunol.v32.i6.10. PMID 23428224. ↑ Semyon Zalkind (2001). Ilya Mechnikov: His Life and Work. Honolulu, Hawaii: University Press of the Pacific. pp. 78, 210. ISBN 0-89875-622-7. 1 2 3 Sabine A. Eming1, Thomas Krieg and Jeffrey M. Davidson (2007). "Inflammation in Wound Repair: Molecular and Cellular Mechanisms" (PDF). come.mx. Retrieved 2013-08-17. Monocytes/macrophages. Unless stimuli for neutrophil recruitment persist at the wound site, the neutrophil infiltration ceases after few days, and expended neutrophils are themselves phagocytosed by macrophages, which are present at the wound side within 2 days after injury. ↑ David M. Mosser & Justin P. Edwards (December 2008). "Exploring the full spectrum of macrophage activation". Nature Reviews Immunology. 8 (12): 958–969. doi:10.1038/nri2448. PMC 2724991 . PMID 19029990. ↑ "The lymphocyte story". New Scientist (1605): 1. Retrieved 2007-09-13. ↑ Galdiero, MR; Garlanda, C; Jaillon, S; Marone, G; Mantovani, A (2012). "Tumor associated macrophages and neutrophils in tumor progression". J Cell Phys. 228 (7): 1404–12. doi:10.1002/jcp.24260. PMID 23065796. ↑ Hotamisligil GS (2010). "Endoplasmic reticulum stress and atherosclerosis". Nature Medicine. 16 (4): 396–399. doi:10.1038/nm0410-396. PMC 2897068 . PMID 20376052. ↑ Oh J, Riek AE, Weng S, Petty M, Kim D, Colonna M, Cella M, Bernal-Mizrachi C (2012). "Endoplasmic reticulum stress controls M2 macrophage differentiation and foam cell formation". Journal of Biological Chemistry. 287 (15): 11629–41. doi:10.1074/jbc.M111.338673. PMC 3320912 . PMID 22356914. ↑ Krippendorf, BB; Riley, DA (January 1993). "Distinguishing unloading-versus reloading-induced changes in rat soleus muscle". Muscle Nerve. 16 (1): 99–108. doi:10.1002/mus.880160116. PMID 8423838. 1 2 3 St Pierre BA; JG Tidball (1994). "Differential response of macrophage subpopulations to soleus muscle reloading following rat hindlimb suspension". Journal of Applied Physiology. 77 (1): 290–297. PMID 7961247. ↑ Tidball JG, Berchenko E, Frenette J (1999). "Macrophage invasion does not contribute to muscle membrane injury during inflammation". Journal of Leukocyte Biology. 65 (4): 492–498. PMID 10204578. 1 2 Schiaffino S, Partridge T (2008). Skeletal Muscle Repair and Regeneration. Advances in Muscle Research. 3. p. 380. 1 2 de la Torre J., Sholar A. (2006). Wound healing: Chronic wounds. Emedicine.com. Accessed January 20, 2008. ↑ Expert Reviews in Molecular Medicine. (2003). The phases of cutaneous wound healing. 5: 1. Cambridge University Press. Accessed January 20, 2008. ↑ Lorenz H.P. and Longaker M.T. (2003). Wounds: Biology, Pathology, and Management. Stanford University Medical Center. Accessed January 20, 2008. ↑ Swirski, F. K.; Nahrendorf, M.; Etzrodt, M.; Wildgruber, M.; Cortez-Retamozo, V.; Panizzi, P.; Figueiredo, J.-L.; Kohler, R. H.; et al. (2009). "Identification of Splenic Reservoir Monocytes and Their Deployment to Inflammatory Sites". Science. 325 (5940): 612–616. Bibcode:2009Sci...325..612S. doi:10.1126/science.1175202. PMC 2803111 . PMID 19644120. ↑ Jia, T.; Pamer, E. G. (2009). "Dispensable But Not Irrelevant". Science. 325 (5940): 549–550. Bibcode:2009Sci...325..549J. doi:10.1126/science.1178329. PMC 2917045 . PMID 19644100. ↑ Deodhar, AK; Rana, RE (1997). "Surgical physiology of wound healing: a review". Journal of Postgraduate Medicine. 43 (2): 52–6. PMID 10740722. ↑ Rosenberg L., de la Torre J. (2006). Wound Healing, Growth Factors. Emedicine.com. Accessed January 20, 2008. ↑ Newton, P. M.; Watson, J. A.; Wolowacz, R. G.; Wood, E. J. (2004). "Macrophages Restrain Contraction of an In Vitro Wound Healing Model". Inflammation. 28 (4): 207–14. doi:10.1023/B:IFLA.0000049045.41784.59. PMID 15673162. ↑ Greenhalgh, D.G. (1998). "The role of apoptosis in wound healing". The International Journal of Biochemistry & Cell Biology. 30 (9): 1019–1030. doi:10.1016/S1357-2725(98)00058-2. PMID 9785465. ↑ Mercandetti M., Cohen A.J. (2005). Wound Healing: Healing and Repair. Emedicine.com. Accessed January 20, 2008. ↑ Stashak, T.S. ; Farstvedt, E.; Othic, A. (2004). "Update on wound dressings: Indications and best use". Clinical Techniques in Equine Practice. 3 (2): 148–163. doi:10.1053/j.ctep.2004.08.006. 1 2 Souppouris, Aaron (2013-05-23). "Scientists identify cell that could hold the secret to limb regeneration". the verge.com. Researchers have identified a cell that aids limb regrowth in Salamanders. Macrophages are a type of repairing cell that devour dead cells and pathogens, and trigger other immune cells to respond to pathogens. 1 2 James W. Godwin; Alexander R. Pinto & Nadia A. Rosenthal (2013-04-24). "Macrophages are required for adult salamander limb regeneration". University of Texas. ↑ Bonnardel J, Da Silva C, Henri S, Tamoutounour S, Chasson L, Montañana-Sanchis F, Gorvel JP, Lelouard H (2015). "Innate and adaptive immune functions of peyer's patch monocyte-derived cells". Cell Reports. 11 (5): 770–84. doi:10.1016/j.celrep.2015.03.067. PMID 25921539. ↑ Mosser, DM; Edwards, JP (Dec 2008). "Exploring the full spectrum of macrophage activation.". Nature reviews. Immunology. 8 (12): 958–69. doi:10.1038/nri2448. PMC 2724991 . PMID 19029990. ↑ Ryan KJ, Ray CG (editors) (2004). Sherris Medical Microbiology (4th ed.). McGraw Hill. ISBN 0-8385-8529-9. ↑ "Chikungunya Disease: Infection-Associated Markers from the Acute to the Chronic Phase of Arbovirus-Induced Arthralgia". PLoS Neglected Tropical Diseases. 6: e1446. doi:10.1371/journal.pntd.0001446. Retrieved 2012-06-14. ↑ Lucas AD, Greaves DR (November 2001). "Atherosclerosis: role of chemokines and macrophages". Expert Rev Mol Med. 3 (25): 1–18. doi:10.1017/S1462399401003696. PMID 14585150. ↑ Frantz, Stefan; Nahrendorf, Matthias (2014-05-01). "Cardiac macrophages and their role in ischaemic heart disease". Cardiovascular Research. 102 (2): 240–248. doi:10.1093/cvr/cvu025. ISSN 1755-3245. PMC 3989449 . PMID 24501331. ↑ Koppensteiner, Herwig; Brack-Werner, Ruth; Schindler, Michael (2012-10-04). "Macrophages and their relevance in Human Immunodeficiency Virus Type I infection". Retrovirology. 9 (1): 82. doi:10.1186/1742-4690-9-82. ISSN 1742-4690. PMC 3484033 . PMID 23035819. ↑ Gary Stix (July 2007). "A Malignant Flame". Scientific American. 297 (1): 46–9. Bibcode:2007SciAm.297a..60S. doi:10.1038/scientificamerican0707-60. PMID 17695843. ↑ Lin EY, Li JF, Gnatovskiy L, Deng Y, Zhu L, Grzesik DA, et al. (2006). "Macrophages regulate the angiogenic switch in a mouse model of breast cancer". Cancer Res. 66 (23): 11238–46. doi:10.1158/0008-5472.can-06-1278. PMID 17114237. ↑ Bingle L, Brown NJ, Lewis CE. The role of tumour-associated macrophages in tumour progression: implications for new anticancer therapies. J Pathol 2002; 196:254-65. ↑ Escobar G, Moi D, Ranghetti A, et al. (Jan 2014). "Genetic engineering of hematopoiesis for targeted IFN-α delivery inhibits breast cancer progression.". Sci Transl Med. 6 (217): 217. doi:10.1126/scitranslmed.3006353. PMID 24382895. ↑ Weisberg SP, McCann D, Desai M, Rosenbaum M, Leibel RL, Ferrante AW. Obesity is associated with macrophage accumulation in adipose tissue" Journal of Clinical Investigation 2003; 112:1796-808. ↑ Bolus, WR; Gutierrez, DA; Kennedy, AJ; Anderson-Baucum, EK; Hasty, AH (October 2015). "CCR2 deficiency leads to increased eosinophils, alternative macrophage activation, and type 2 cytokine expression in adipose tissue.". Journal of leukocyte biology. 98 (4): 467–77. doi:10.1189/jlb.3HI0115-018R. PMID 25934927. 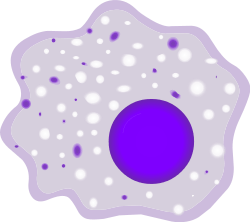 Wikimedia Commons has media related to Macrophages.